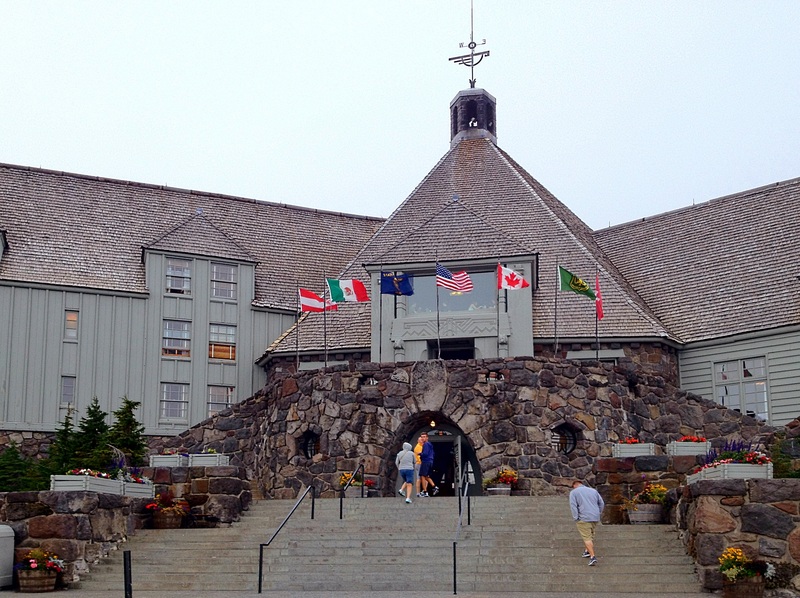 As you approach the façade of Timberline Lodge, its two outstretched wings embrace you and you instantly feel welcome. 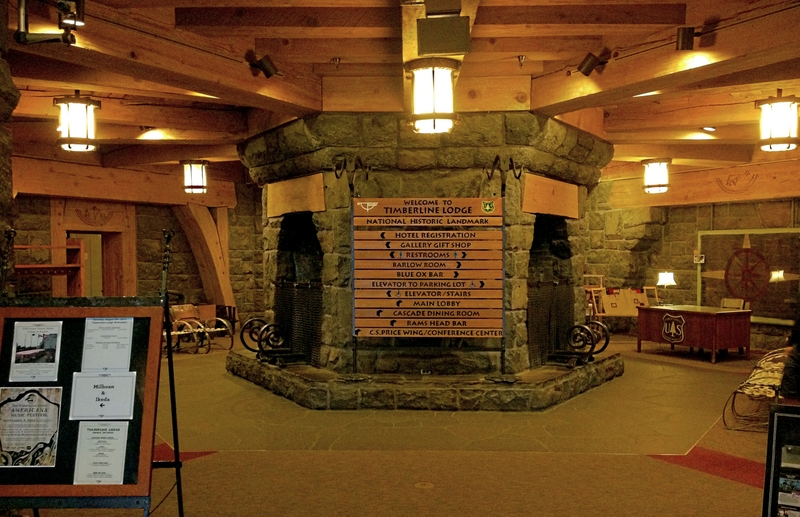 Entrance to the Lodge is through a massive wood door under a stone arch at the base of hexagonal head-house (above). 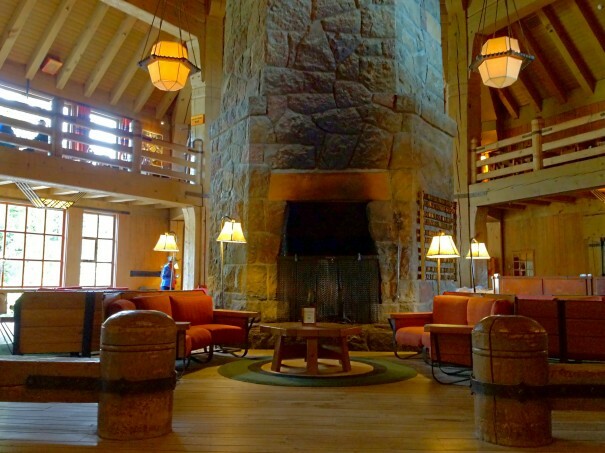 Once inside, you’re immediately presented with a colossal hexagonal chimney (below) outfitted with three independent fireplaces. Beefy, hand-hewn timbers on the ceiling radiate out from the center of the room, and a large hand-carved sign directs your next move. Through the arched doorway at left (above), one of multiple stairways lead to the upper floors of the lodge. It is here that we begin to see the stamp of the lodge’s original interior design supervisor, Margery Hoffman Smith. The newel posts, railings, and balusters are all hand-carved in different mountain animal motifs (below) and paired with elaborate ironwork executed beautifully by master craftsmen Ray Neufer and Orion B. Dawson. In the stairway, you’re surrounded by several different species of locally harvested wood. 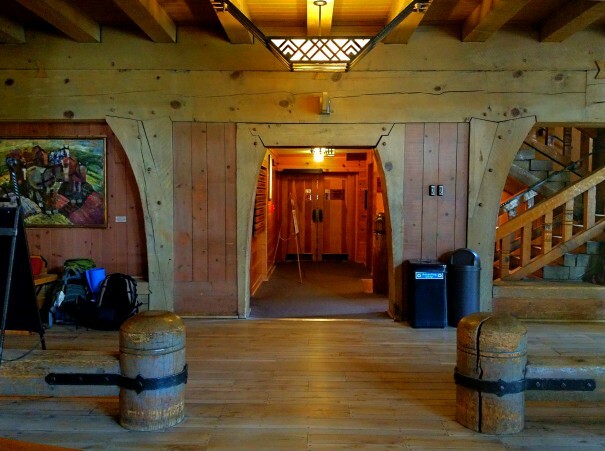 Oregon white oak, knotty pine and Douglas Fir are all well-represented with more hand-carved details and wrought iron at every turn (above right). 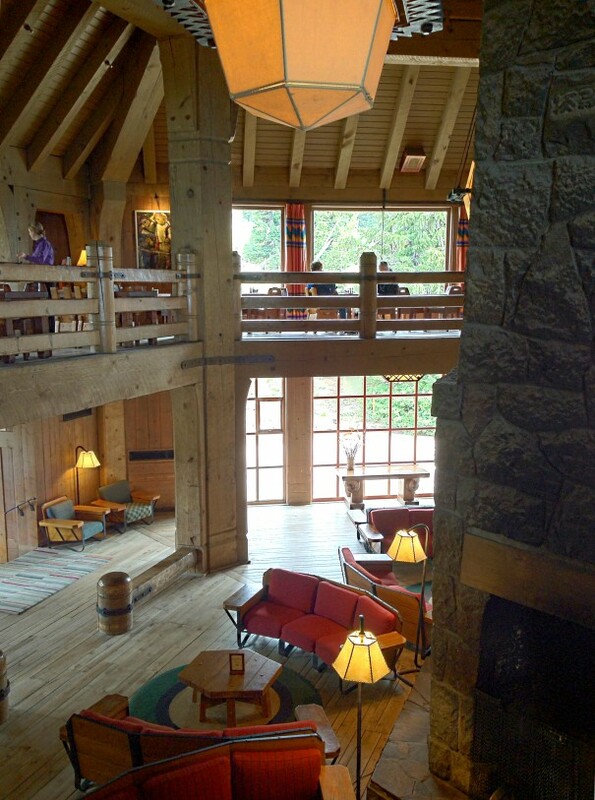 But it’s not until you emerge from the stairway, that the lodge’s true magnificence is on full display (below). 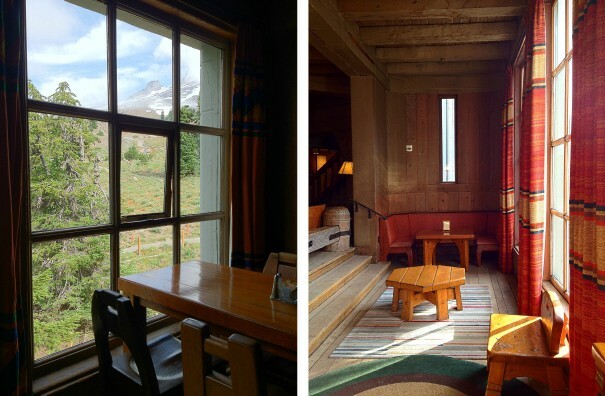 The interior of the head-house (above) is absolutely captivating and epitomizes, in my opinion, what a mountain lodge should look like. 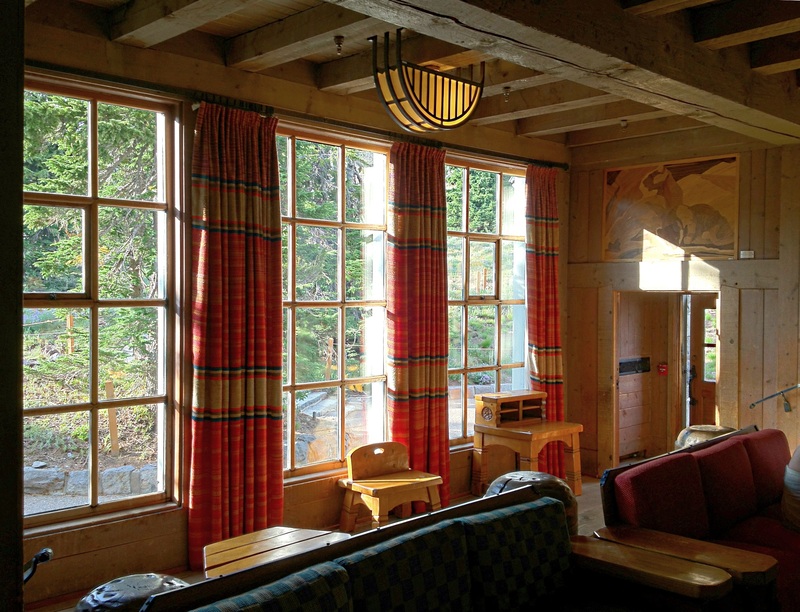 When compared to the relatively low-ceilinged entry room on the lower level, the grand hall’s soaring space successfully executes a compression-and-expansion effect often used by Frank Lloyd Wright. 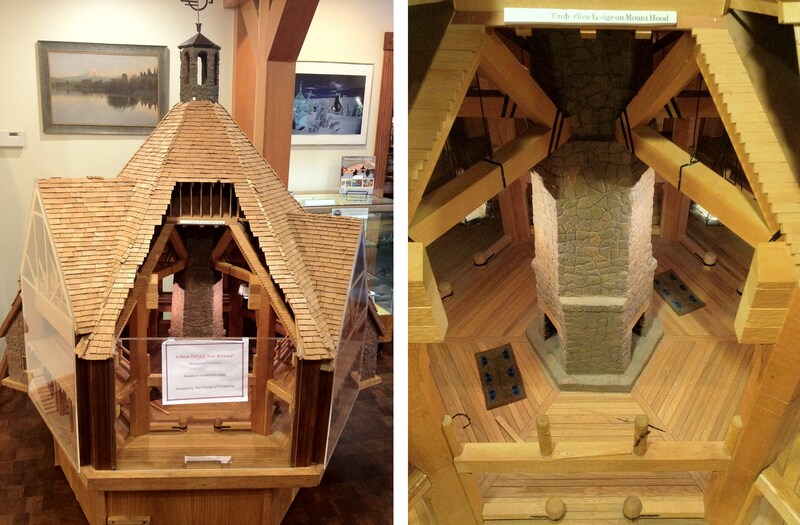 The head-house’s dominant feature is the towering fireplace and chimney at the center of the room (above). 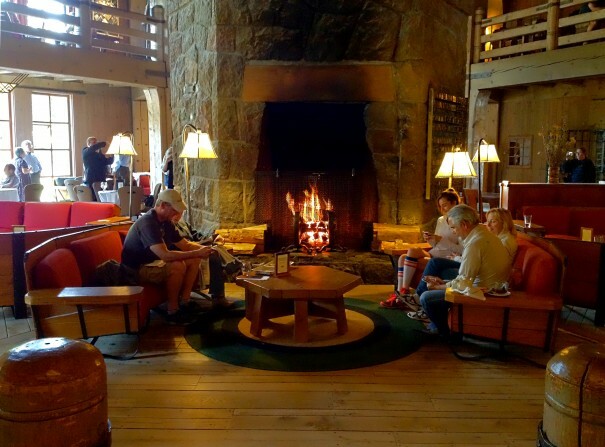 As on the lower level, there are three fireplaces, each with its own seating area, creating an intimate space for guests to gather (below) in an otherwise voluminous room. 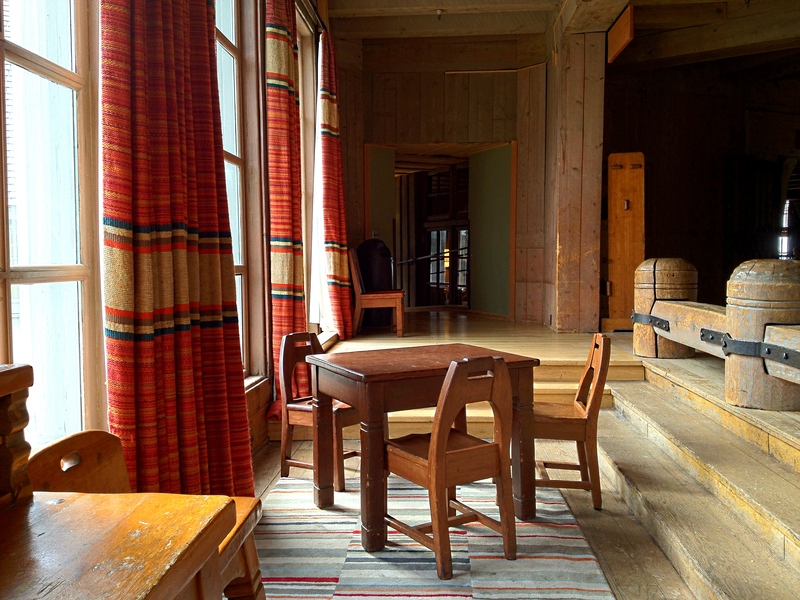 Handcrafted furniture and textiles fill out the space. Tucked beneath the upper mezzanine that rings all sides of the room, more intimate gathering places offer cozy seating and glimpses of the omnipresent Mt. Hood (below left). Above and below, Margery Hoffman Smith’s omnipresent interior design efforts can be seen working in harmony. Custom furniture, handmade lighting, Native American-inspired textiles and original artwork all coalesce to provide a warm, relaxing backdrop any day of the year. Through mid-summer sun, or mid-winter snow, this lodge has seen it all. 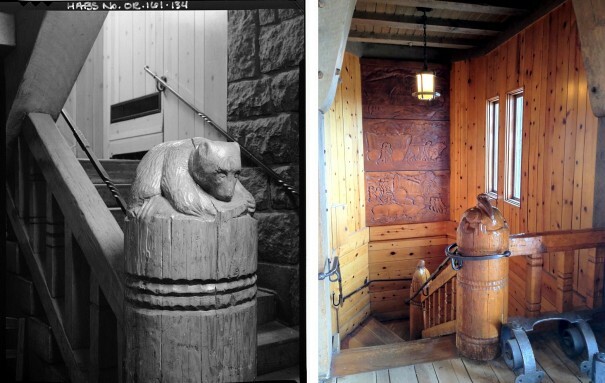 To get to the upper mezzanine, it’s a back out through one of staircases (below right) where you’re re-introduced to more handcarved animals on the newel posts and custom ironwork. 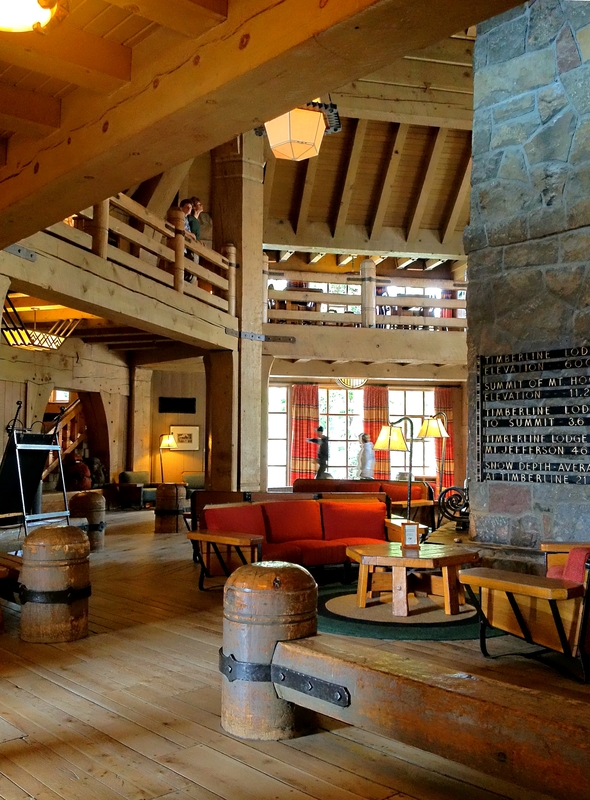 Once upstairs, you can appreciate the massive timbers that form the skeleton of the lodge. The Mount Hood Cultural Center & Museum in nearby Government Camp, Oregon has a great cross-sectioned display (below) where you can get a bird’s eye view of the inner workings of the head-house. 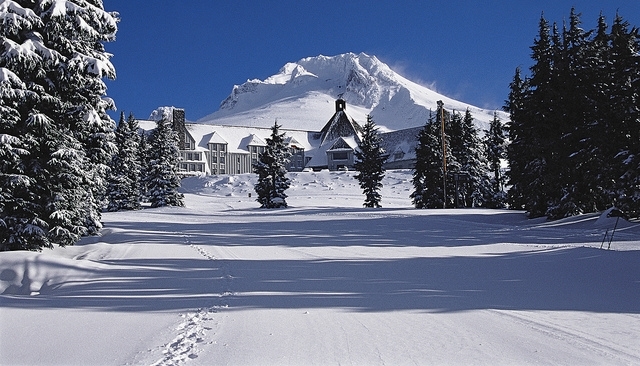 The museum also exhibits a great collection of documents, books, photographs, artifacts and other cultural objects related to Mount Hood. 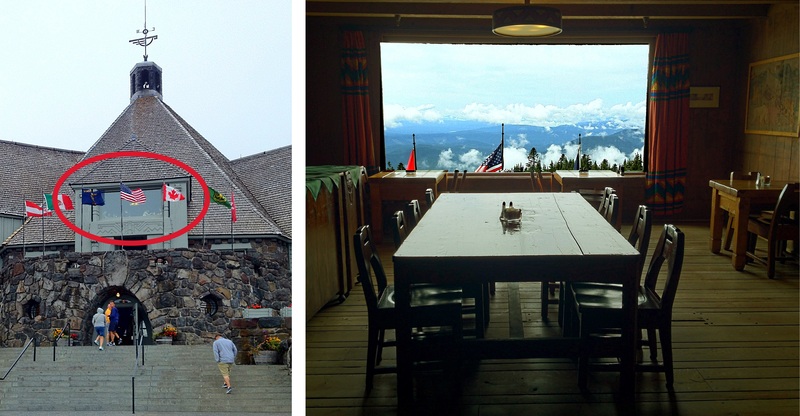 One of the best views upstairs (below right) looks out the front of the lodge from the large bay window above the main entrance (below left). The view looks out to the south and west, and on clear days the Cascadian foothills and the volcanic peaks of Mount Jefferson (10,495 ft elevation) and the Three Sisters (10,000+ feet each) can all be seen. 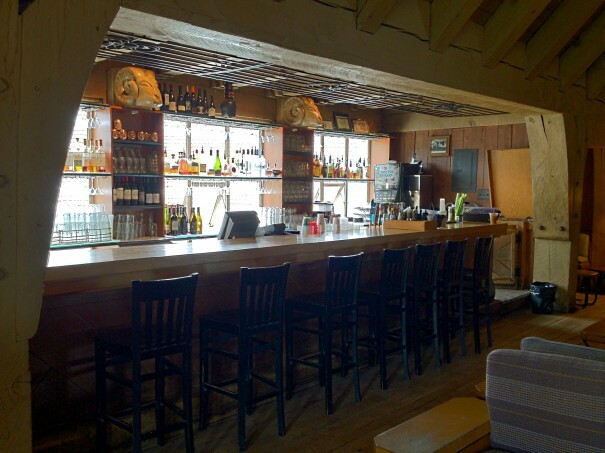 Also upstairs is the Ram’s Head Bar (below), where you can grab some après ski food and drink and warm up after a long day on the slopes, or on the trails. Today, Timberline Lodge stands as a testament to what can be accomplished when politics is put aside and government works in the interest of the public. Recently, the US government again came to the aid of this aging Federally-owned icon – this time, to address a backlog of countless maintenance issues that sorely needed to be updated and/or repaired. More than 2 million people visit the Lodge every year, and these improvements will go a long way to see that Timberline Lodge can endure for decades to come.